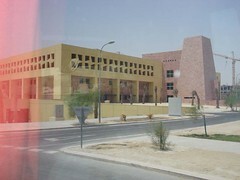 Here in Qatar I work at Qatar Academy, a PreK-12 school now delivering the IBO curriculum across all levels (PYP, MYP and DP) which is located on Education City, a large campus on the outskirts of Doha. However I work for Qatar Foundation (QF) for Education, Science and Community Development. QF represents the innovation and creativity of His Highness Sheikh Hamad Bin Khalifa Al Thani, Emir of the State of Qatar. 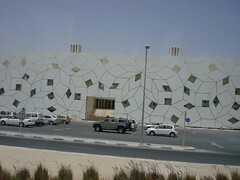 QF is a non-profit organisation and was founded in 1995, and Education City is their flagship. Two weeks ago all new staff at Education City were treated to a presentation about QF, then loaded onto buses and shown the around the campus and finally given a sumptuous buffet lunch. Images from the campus can be found on my Flickr group for Qatar. The vision and commitment to excellence in education here is amazing. The money being spent and the rate of development is staggering. QF is the driving force behind the countries commitment to education and to Qatar becoming one of the most developed knowledge-based societies around the world. To do this they are partnering with international educational institutions, supporting higher research and contributing to community health and development programs. Her Highness, Sheikha Mozah Bint Nasser Al Missned, Consort of His Highness, serves as the chairperson of QF and personally guides the organisation with passion, vision and enthusiasm. I have not met Sheikha Mozah yet but have heard and read about what she is doing. I am excited to be here working with visionary leaders of a country that is willing to put money into education and to promote reform and freedom of speech within the Middle East. "With good will and a sense of global responsibility we can achieve our objectives: Global education on an educated globe". "Our goal is to do as our ancestors did before us, who believed in the urgency of meeting other civilisations, but not melting into them. And this is why we believe in the power of education to guide us toward this goal". 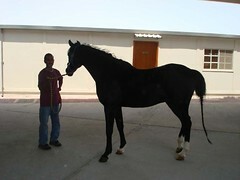 Plans are underway with major building taking place to create an equestrian centre, Al Shaqab. 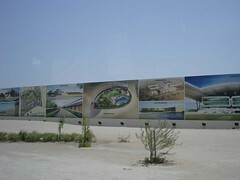 It will be a state-of-the-art venue housing the Emir's stables, international arena, riding academy etc. We visited this as part of our tour and met the Emir's famous black stallion, the one he rode when opening the Asian Games in December 2006. 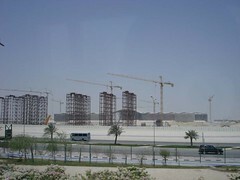 Also under construction is an enormous convention centre, on the land opposite the main Education City campus. Watch this space as this is going to be BIG. 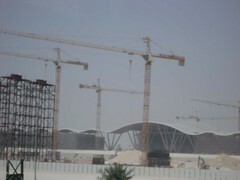 One day soon Qatar will be able to host large regional conferences and become a focal point for meetings of all sorts. I still have not covered all of the QF initiatives! Future plans include a central library, another recreation centre etc etc. Nice to see you back at it, Julie. The buildings in Qatar are sure beautiful! QA sounds fantastic Julie! I actually remember looking into that school a few years ago when I ended up in KL... It sounds like it's only gotten better since then! Some of my close friends from KL have also moved to Qatar this year (they're teaching at AS Doha). I can't wait to see and hear all about life in Qatar! Great comment on Qatar's forward looking initiatives. At a time of much gloom and loss of hope, Qatar's effort's offer a refreshing way forward and provide much relief to a jaded world. I attended Qatar's independence day reception in Washington, DC on December 19, 2007 and look forward to working with the public and private sectors in that wonderful country via our law firm www.marylandattorneyatlaw.com and our renewable energy affiliate firm www.renewableenergy21.com. We do have a Pre K to 12the Grade solar technology learning module via one of our partners which may interest you or those at the school referenced. If you care to know more call me at 301-218-9400 or e-mail me at gabrielchn@aol.com.